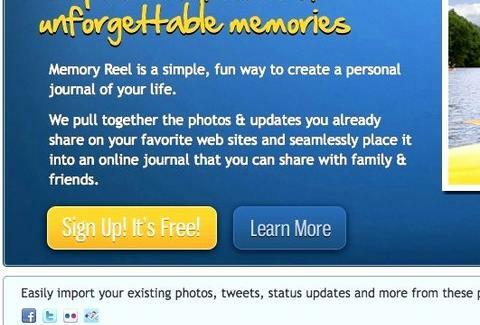 Developed by an ex-TI/Microsoft product developer and the self-taught code guy behind Twitter's first-ever aggregator, free-to-use Reel creates "a personal journal of your life" by sucking in and neatly arranging your online existence: images, video, caption text, social-networking updates & check-ins -- so the only thing standing between you and being in the FBI is a cool windbreaker. Just input name/email/password for Facebook, Twitter, Foursquare, & Flickr (coming soon: Gowalla, Google, Photobucket, etc), and Reel will import the relevant data, then order it chronologically & by location, complete with time stamps/Gmap plots with the original web-service icons intact; from there, you can either rearrange images or delete them, plus add event titles and fresh captions, like "I once caught a fish this big! ", or "Me, lying about the size of a fish I caught". The resulting "Memory" document can then be blasted as a Facebook wall post/message, Tweet, or email using a multi-tier filter system (Private, Family, Friends...), with the option of removing individual contacts on most services (necessary if you don't want "Family" and "Friends" to eventually dwindle down to "Private"). Looming enhancements include full Facebook Connect/Sign in with Twitter functionality, a streaming option that'll auto-post/send completed pages, and a collaborative tool that'll let you siphon others' content into yours, smoothly enabling another formerly unmanly act, sharing.